Is your Samsung washing machine showing the error code DC or UE? If you are doing a wash load in your Samsung washer and either of these error codes show up on your washers display, it means that you have an unbalanced load. This is not a serious error code, it simply means there is too much clothing in your washer or it has accumulated to one side and because of that the load is UNBALANCED. You may have bed sheets or towels in the washer and there are either too many sheets or towels or they have found their way to one side of the washer therefore the washer tells you it has an unbalanced load. SAMSUNG DC ERROR CODE: The DC error code shows on your washers display when your Samsung washer is unable to spin DUE to an unbalanced load. 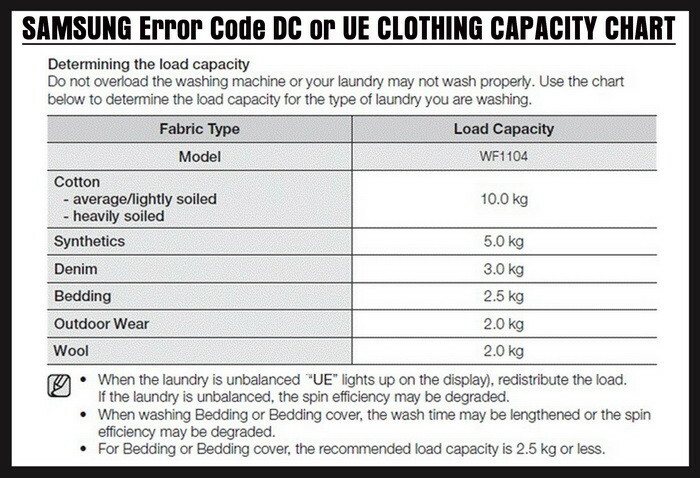 SAMSUNG UE ERROR CODE: The UE error code tells you that the laundry load is unbalanced and therefore cannot spin. Both of the DC & UE error codes work together to tell you that you have an unbalanced load and because of that… the WASHER WILL NOT SPIN. Once you have taken some clothing out of your Samsung washer or you have redistributed the load of laundry: PRESS THE START/PAUSE BUTTON TO CLEAR THE ERROR. If you need help or have issues with the DC or UE error code on your Samsung washer, please leave a question below and we will be happy to assist. Samsung Washer with “DC” error code might be fixed with….. Problem: My 2013 Samsung washer was a repeating “DC” error code. Regardless of the size of load, it would cycle down to the 9 minute, spin up making a loud banging noise, and then jump backward to the 17 minute mark, attempt another rinse cycle, eventually it would terminate with the “DC” error code. Solutions that didn’t work: The web offered several, (foam, rubber ties) but they did not work for me. Solution that worked: I replace all 4 Washer Damper, Samsung DC97-05280W. When I replaced the old ones I then understood why they failed. The old ones had grease that failed thus the damper rods vibrated at different rates, causing the “DC” code. Replacing those 4 rods worked for me. My samsung washing machine gets a dc error code almost every time I wash a load. Is there any chance the actual machine itself could be unbalanced or another alternative to the load being too large or unbalanced? My Samsung washer gets a DC error now on every load. This just started when I had a load of towels and sheets. Now every single load is throwing the DC error even when there is a small load and it’s isn’t unbalanced. Is it a part or can the washer be “reset” ? Help! I fixed the DC error code, finally. The issue I was having is that any kind of load, no matter how evenly I distribute the clothes, no matter how light or heavy the load was, it would get to the 9th minute, make a loud banging noise, and then jump to the 17th minute to rinse again. Then, eventually it would give the DC error. After some serious Google-ing, I ran across the website appliancepartspros and there were tons of comments on top loader washing machine having the same issue. The fix – replace all 4 suspension rods. Since replacing those rods, my washer acts as good as new. Even after clearing the D.C. Error code, my machine no longer spins (it spun fine previously.) I have completely emptied the machine and it will not spin. Any tips? My washer came up with UE,the problem is I cannot open the door to do anything about it…..does anyone know what I have to do to open locked door…. My washing machine has alarm error code UE during it’s starting spin. I need to know which part is the real cause. Add more clothing or a towel to the wash to “balance it out”. The sensor may get confused if only washing a small amount of clothing. Samsung washer just began the dc code a couple of weeks ago. Even while lightening and redistributing the weight. The problem persists. Any thoughts? My clothes are evenly distrubted in my top loader samsung and the UE keeps displaying.I try just the spin cycle and the same thing happens.What should I do? I am constantly getting the error code that says the load is unbalanced and the machine stops. The Samsung Washing Machine either constantly starts itself over or chimes until I open the lid and redistribute the laundry load. But no matter how small my load is it is always doing this with just about every load of laundry. The loads of laundry I am doing are smaller than the loads we used to do. I have the washer that was recalled and had the part replaced and ever since then it keeps giving the out of balance code and won’t finish through the spin cycle. Can someone please advise on how to fix this problem yet again. It does not matter what I put in this washing machine I get a “DC” code every time! I can do as much redistributing in the world and it still does not work!!! It takes forever to get a load of clothes washed with this stupid Samsung washing machine! I came across this issue with my Samsung top load washing machine and below troubleshooting helped to resolve this issue. This may work for other top loads as well. 1) Try running the machine in spin mode with no clothes. if it runs and you hear lot of vibrations then its a purely alignment issue. 2) Identify the correct alignment spot. its easy to identify the correct spot. While spinning try to tilt the machine forward (little bit) and at one particular angle you will hear no vibration at all. 3) identify the gap between Machine and Floor. 4) Keep some flat object underneath with the same height. 5) Prefer to keep wooden piece. In case your machine doesn’t spin with out any cloth, then also you can try the above, however its going to be hit & try. You really need to try with multiple angles. My Samsung washing machine keeps saying DC. I would redistribute the clothes but still it keeps saying DC. 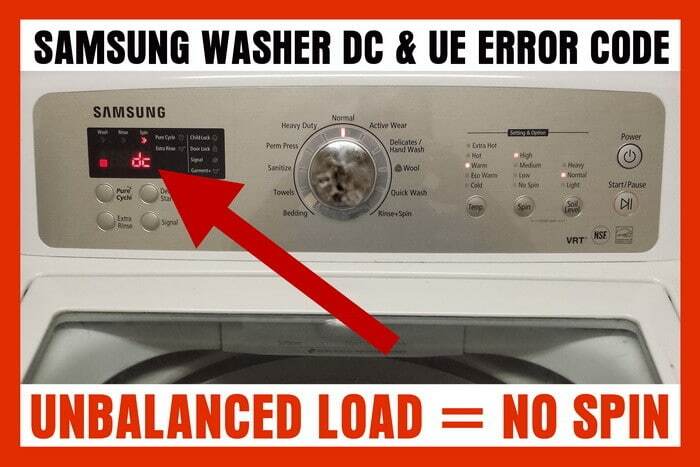 The DC error code occurs when a Samsung washer is unable to spin due to an unbalanced load. Try to redistribute the items inside the washer and press the Start/Pause button to clear this error. Mine will do this with EVERY load, no matter how small or big. I can often put it in repair mode to make it spin out and it will work fine, but when in normal mode it will throw itself off balance every time. It’s even doing it some without any clothes in the washer. How do you put it in repair mode? My Samsung has just recently started with the DC code. It drains, starts to spin, and then starts hard loud noises and codes. I’ve pulled clothes out and redistributed. I’ve had my washer for a while now, and it’s always been great. I really can’t afford a repairman right now! The only time my washer doesn’t pop up the DC code is when I run it completely empty with no clothes in it at all. It doesn’t matter if I have a big load of clothes or a very small load of clothes, the DC code always pops up. You probably have a load sensor error, can you tell us the complete model number of your Samsung washer? I have model wa456drhdsu/aa01 out of balance on everything. Or anything. Yes it is level. Suspension rods are not visibly broken. And I hear liquid in the balance ring. Any ideas ? Dc error also. I get the DC code ALL THE TIME ON EVERY LOAD!!! HELP!! I redistribute 3-4 times during a wash cycle! It takes forever to get ONE LOAD DONE!!!! Hate this Samsung!!! Try running an empty load and see if the error appears. I get the DC code every time I was a load whether its 4 things or a full load…I have ran an empty load and it did just fine… What can this be? Same here! I have no time to repeatedly run this washer til it doesn’t have the DC error. My Samsung top load does the same. Suspension rods have been replaced and the machine is still under warranty. But all of a sudden, Samsung doesn’t have anyone to fix it. I have had a problem with the dc code for some time now. I have had a repair man look at the machine, actually took it back to his shop and said nothing was wrong with it, he brought it back I did three loads of laundry and the next load got the dc code, No matter what I do, re distribute the clothing, turn off, turn on, set to rinse/spin, change the load – normal, heavy, towels, etc. I still get the same code. We have had the machine just less than a year. I am beyond upset with Samsung. Might be a sensor, tub stabilizer, or the main board is defective. Did the service tech check all sensors, stabilizers, and the main control board? My washer shows DC error code on every load. I’ve redistributed the clothing. Taking clothes out. Restarted on spin only. Keeps stopping with DC error even with only two or three items. Never done before. Now it does this several times each load. Takes hours to do 1 load. What should I do? Have you tried to press the Start/Pause button to clear the DC error on your Samsung washer. If nothing solves the DC eroor code, you may have a sensor that is bad or simply not connected (loose). Check wiring harnesses as one may be loose and causung the error. Connect and reconnect if possible. Let us know what you find. I re-distribute and re-distributed it in different ways. This does not work. I put only two identical pieces evenly distributed…not working. Then four pieces and …Don’t Work. I think the best way to level is filling with some water and checking the water level touch the same line of holes in the inner drum. You have to revise that all feets touch firmly the floor. I used memory foam, a pillow, a wooden stick, etc, etc. I padded first the upper side…then the lower side…I tried differents padding configurations….work one time in 20 tries…and then DC ERROR again. If you think that the center plastic part of the suspension rod should move freely…thats and error. The “shock absorber” action is not working if the center plastic over the coil moves freely. Cleaning make it worst. Oiling them does not work neither. The new ones that I received has much resistance to movement…and have a very sticky grease on the rod. WHAT SOLVE MY PROBLEM ? I BUY THE FOUR SUSPENSION RODS AND INSTALLED THEM…at the same time. NOW WORKING FOR 2 MONTH STRAIGHT. I THINK THE SPAN LIFE FOR THEM WILL BE TWO AN HALF YEARS….Shame on Samsung ! Next post: How To Tell If Your Electric Hot Water Heater Is Bad?